The Discus fish originally comes from the Brazilian part of the Amazon River in South America. The Discus lives in waters that are a mix of clear and muddy tributaries. They have bodies dominated by one color with bright stripes on their bodies and fins of a strongly contrasting color. There are a variety of different discus fish. The pigeon blood discus is yellow. The red turquoise discus is red and blue with bright turquoise stripes. The Red Marlboro discus is orange and red with dark orange stripes and purple tipped fins. The neon blue discus is literally neon blue with white strips. The ocean green discus is brownish green with neon green stripes. The snakeskin discus is red with neon blue stripes in a pattern similar to snakeskin, hence the name. 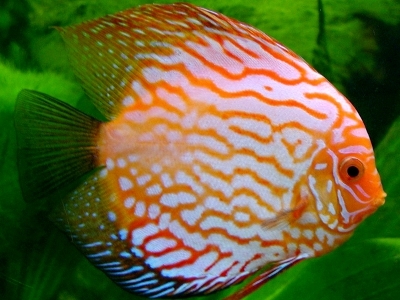 The royal red discus is bright red with deeper red areas. The checkerboard discus is bright blue with black stripes. The white discus is white with lightly patterned fins. Discus fish are popular in fresh water aquariums. They will interact with people, whereas most tropical fish simply swim around or hide at lights and sounds. They will watch movement such as when someone crosses a room or the action on a television. Discus fish are popular for their personable behavior, doing things like eating food from your hand. Discus fish are social creatures with their own species, as well. Unlike many fish, where the mother or the father alone takes care of the eggs, both mother and father raise the young. Discus should be in a tank with several others of their species, not simply a tank with another schooling species, despite the higher price for the discus fish. Discus fish are somewhat easy to take care of. You can use tap water as tank water as long as it does not use chloramines to disinfect the water; the chloramines are a mixture of chlorine and ammonia that break down in the tank into their toxic components that will kill the discus. You might remove these chemicals via a filter or dechlorinating water conditioner. While the wild discus live in waters with high tannin levels from falling leaves, you rarely need to add this to the tank with domesticated discus fish. Do maintain a slightly acidic water with a temperature around 85F.